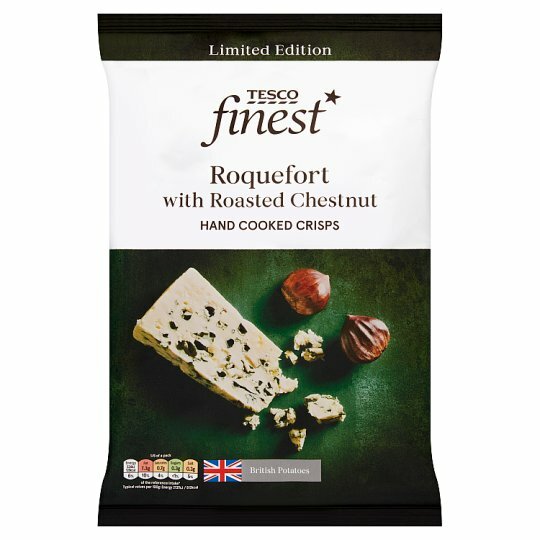 Roquefort blue cheese and roasted chestnuts flavour potato crisps. Hand cooked crisps Our experts in Devon work closely with local farmers to select the variety of British potato that give just the right crunch. Each potato is carefully sliced and fried in small batches under the watchful eye of specially trained fryers. They stir each batch gently, select the best crisps, then tumble them carefully in seasoning for a perfectly even coating. INGREDIENTS: Potato, Sunflower Oil, Rice Flour, Buttermilk Powder (Milk), Yeast Powder, Salt, Onion Powder, Roquefort Blue Cheese Powder (Milk), Citric Acid, Fenugreek Seed, Flavouring, Roasted Chestnut Extract.